THE MUSICIn our mid-twentieth century a lot of talk and speculation is devoted to those vast spaces in which our Earth revolves. The world’s greatest scientists work on rockets and satellites to send out into space, and look to the day when an actual flight may be made to one of Earth’s closer neighbors, while the man-in-the-street and his space-happy small fry, imaginatively tutored by science-fiction magazines, movies, and comic books, possess many fanciful notions of the creatures and conditions which we may find on distant worlds if we ever do get to them. On the assumption that the inhabitants of even the remotest worlds like music as much as we do, many space-minded musicians have attempted to complete our picture of life on other planets by giving us their ideas of the “music” of these distant spheres. Since everyone seems to believe that any sort of “intelligent” life existing outside the earth’s orbit is further advanced than we, most of this music has been produced through the use of complicated electronic sound-effects machines, cleverly handled so as to create tone-patterns which have just enough in common with conventional modern music to be borne by human ears. But this type of “music” really sounds more like the noises of the space-ships in which man hopes to travel to these strange worlds than what he may hear when he gets there, so we cannot expect to get much enjoyment from it—at least not while our ears are so intimately attuned to the sounds of music as we have always known it. 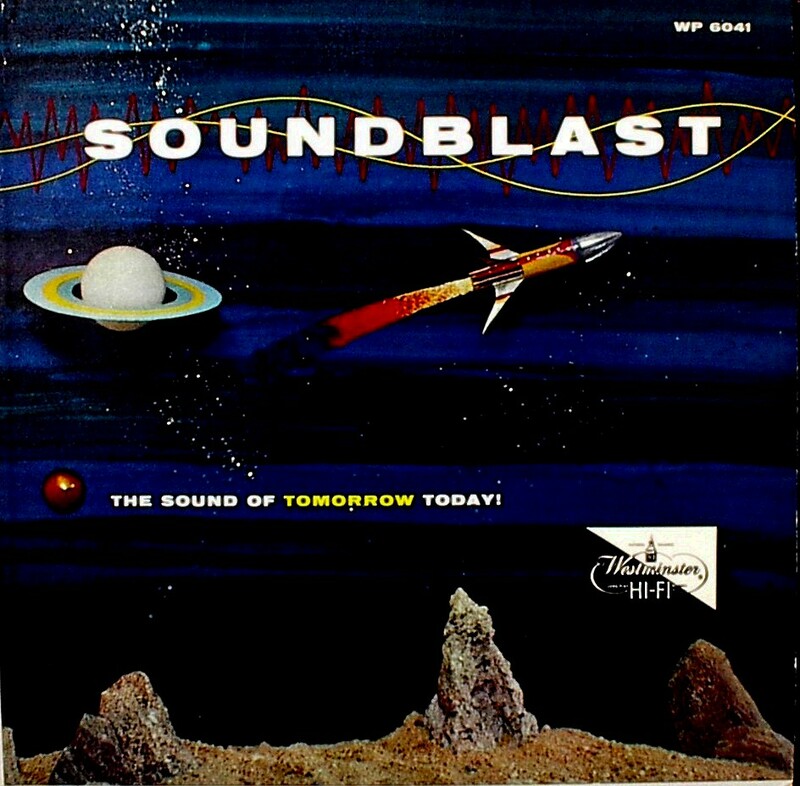 When Westminster decided to record a SOUNDBLAST album the idea of using artificial sound-effects equipment for such a recording was not even considered. It didn’t have to be, for in Ferrante and Teicher Westminster’s engineers knew that they had the solution to creating ideal music for the world of science-fiction with conventional musical instruments—two ordinary grand pianos handled in a most extraordinary fashion. The imagination of these young artists, who have experimented for years with strange and exciting sounds, does more than a studio-full of sound-effects gadgets and machines could ever do to create a new type of music for the world of tomorrow. With a bit of wood or rubber, or a hand or elbow in the right spot at the right time, Ferrante and Teicher make their pianos bring the World of Space to you, even if they cannot carry you off bodily to the World of Space. In one vital respect, however, SOUNDBLAST does depend on the electronic marvels of our earthbound mid-twentieth century. It took the finest custom-made equipment to record it, and—to hear SOUNDBLAST as Ferrante and Teicher conceived it and as Westminster’s engineers heard it in the studio and laboratories—you really do need the best high-fidelity equipment you can get your hands on. In range, volume, and timbre, many of these sounds are so different from what you ordinarily hear on records that they will surely escape your ear if the recording is played on equipment which is unable to do justice to every decibel. But if your rig comes close to being the hi-fi fan’s dream of heaven on earth, and you are a reasonably competent space-sound pilot, SOUNDBLAST is just the thing for you. Ferrante and Teicher chose a group of Latin-American favorites for this album because they felt that the tone coloring and rhythm of this music was particularly well suited to the novel sonic presentation they had in mind. Each number was worked out carefully on paper, with a type of musical notation Ferrante and Teicher have developed for their own use, and the recording was made exactly in accordance with this plan. Nothing was left to chance or to a last-minute bright idea. All you need to do to be sure that this was the right way to handle SOUNDBLAST is to put it on your turntable and let it blast off!. True high fidelity creates "the illusion that the listener's chair is the most favored seat, acoustically, in the concert hall.” This demands clarity, range and, most vital of all, balance, the natural balance of the original music, faithfully recreated. This is Westminster’s “NATURAL BALANCE.” Listen—and Compare.